Nothing to Do with Real Estate? Posted in Nothing to Do with Real Estate? 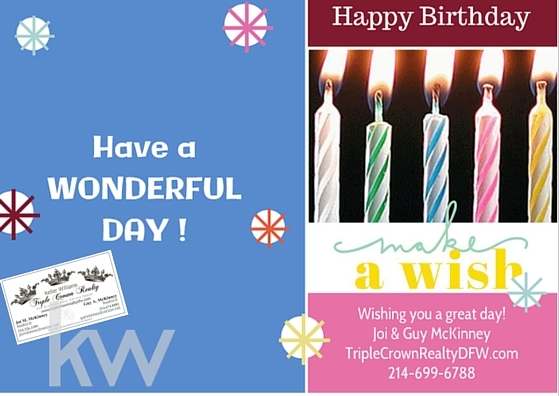 on May 21, 2017 by Triple Crown Real Estate Group ~ brokered by eXp. 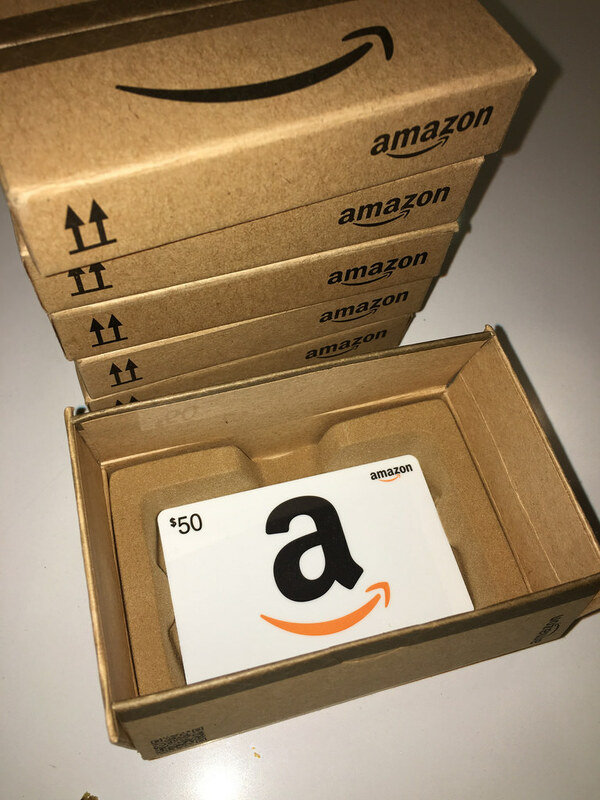 Boxes from online orders to all those moving boxes …use them when cleaning out your closet. Pack your stuff…print out a label and mail it free to Goodwill. A convenient, green and easy way to donate! The box plus those unwanted items don’t go in our precious landfills. 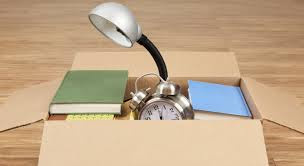 If you have any boxes and anything you no longer need… use Give Back Box®. Check it out at Give Back Box® is a great way to donate unwanted items! Whats the saying, April showers bring May flowers…its so true! Gardening is one of my passions, however since starting our real estate business in 2013, it has been on the back burner. So, I am happy we have planted some things that will bloom with very little attention. Who says things don’t grow in Texas? I have been blessed to have a fabulous back yard that is not only home to lots of fun and entertaining around the pool, but also a gorgeous setting when taking a break from real estate & just taking in the beauty that God provides. Listening to the birds, the cool breeze or the warm sun on my skin. Nothing pleases me more than beautiful flowers! You too can have a beautiful garden here in Texas. When I arrived in Highland Village over 22 years ago, I came from an area on the east coast where the soil was very different and everything that grew easily did not do well here! After trying to plant some of the things I loved on the east coast, I quickly realized I needed to educate myself. I took classes on Texas gardening and found the things that grow here are different but just as beautiful. A good start to learning is the free classes at Calloway’s or a local master garden class (that’s where I started). It was fun and now I enjoy beauty all around me. Check out some classes below! Keep Lewisville Beautiful presents the 2016 Garden Secrets series of classes, led by Denton County Master Gardeners and the Texas AgriLife Extension. All classes will be held at the MCL Grand, 100 N. Charles St., Lewisville, TX 75057 (map) in Classroom 1. Classes are free (with one exception–see below), but space is limited, so RSVP by phone at 972-538-5949 or email at info@keeplewisvillebeautiful.org. City of Lewisville residency is not required. 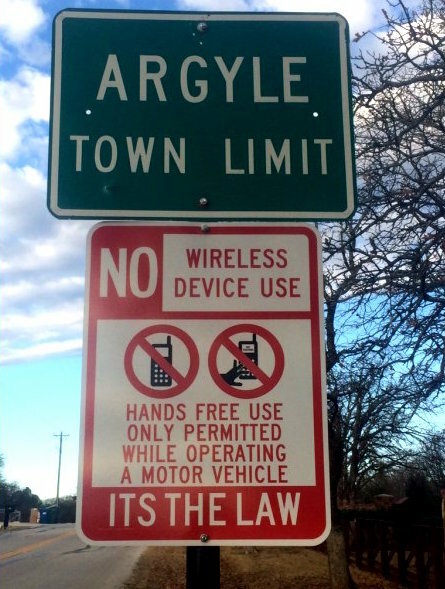 Area News: Argyle-New Law Beware! Another local city has passed a new law! Driving distractions can be a major problem and with the increase in vehicle accidents is was just a matter of time. As safety becomes a concern for the citizens, new laws are put into place. Don’t let yourself be tempted by a text or phone call that comes in while driving ~ there are too many accidents occurring due to this small device, this small device that we seem to be unable to ignore. What can’t wait until you are stopped and safe? Laws will continue to be put into place to make sure you are safe even if you think it would never happen to you. Ask yourself…do you think it is possible? We’ve all heard the stories! Think before you pick up the phone while driving and please be safe out there ~ because even if your not the one…there could be someone else who is in another vehicle being distracted! It is a responsibility that we all should not be taking lightly. Going Bananas? We Don’t Monkey Around! Real Estate should not feel like a circus ! We do believe monkey business should be left for the monkeys and real estate left for the professionals who work in the business full time and are passionate for the clients. Real estate is usually one of the biggest investments you will ever make-so make sure you are not “monkeying” around. 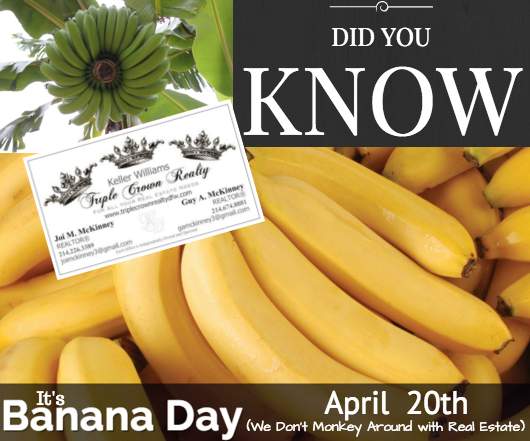 For a little fun we thought we would talk about “Bananas” on Banana Day! Celebrity Birthdays this month include Jon Bon Jovi (3/2), Jessica Biel (3/3), Chuck Norris (3/10), Albert Einstein (3/14), Adam Levine (3/18), William Shatner (3/22), Reese Witherspoon (3/22), Lady Gaga (3/28), and Celine Dion (3/30). A disaster supplies kit is simply a collection of basic items your household might need in the event of an emergency. You may need to survive on your own after an emergency without the help of others. Use this reminder to create a new supply kit or to restock a previously created one.